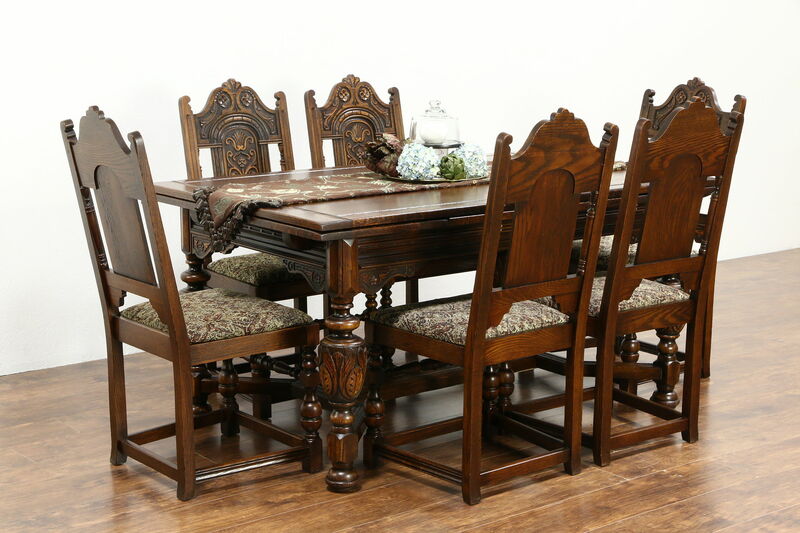 Expertly crafted in the English Tudor manner about 1925 by "Mandel Bros. of Chicago, Ill.," this richly detailed oak dining set includes a table with two pull out leaves and six chairs. The gleaming renewed finish is in excellent condition, preserving the subtle antique shading and "wear" at corners. Frames are reglued to serve another generation, strong and wiggle free. Chair seats are newly upholstered on this superior quality antique furniture. Two armchairs measure 26" wide, 23" deep, 42" tall and seats are 19" high. Four side chairs are 20" wide and 21" deep. Table size is 38" wide, 30 1/2" tall, legroom is 25" underneath and 68" long when closed, with both 17" wide leaves extended, length is 8' overall.